My beloved mother-in-law, Amy, is moving today to a retirement community in LaVerne, California. She'll have a great apartment with a front and back door, and outside space for her little dog to romp. Amy leaves behind decades of gardening in Pasadena. Although the garden I show here is visually quieter than her earlier gardens, she has a history of fearless color decisions in and around her home. Amy's was the first house I ever saw painted terracotta orange, a color that instantly enhanced the deep green foliage surrounding it. Bright yellow carolina jessamine (Gelsemium sempervirens) and Lady Banks climbing rose swarmed all over her wide front porch. I remember gorgeous orange clivias and the fragrance of a neighbor's orange tree that hung over into the back patio of her previous home. The showpiece of the garden she leaves today is a neighbor's spectacular live oak (Quercus agrifolia) with one enormous branch extending into her back patio. These trees are highly valued in Pasadena, and just this one amazing branch sealed the deal when she bought the house some years ago. I look forward to seeing how your newest garden space takes shape. And I know that your new home, both indoors, and out in the garden, will be a warm and welcoming place I'll love to visit! Lan Su plant sale alert! Just what you need to know this fine almost-spring day: a local yearly plant sale has expanded! Lan Su, the Portland Chinese classical garden holds a plant sale each spring, and offerings have been interesting in past years. The main focus is on typical plants grown in the garden, like bamboo, rhododendrons and camellias, but there are lots of other options. This year's sale is Saturday and Sunday, March 20 and 21 from 10 to 3. The impressive specialty plant vendor list numbers over 20 this year. There also will be folks from the Oregon Camellia Society showing camellias and answering questions. This year, the sale is being held outside the garden walls, which means you can attend the sale without paying for garden admission. But plan to visit the garden another time - it's lovely and serene almost any day of the year. The early-bird, members only sale happens from 9-10 on Saturday. I hear it's going to be a beautiful weekend, perfect for plant shopping and gardening. It's the fifteenth of the month, the day garden bloggers write about what's blooming in their gardens. The MulchMaid has a lot more going on this month than last. Indoors, the Meyer lemon has awoken from its long winter sleep and is blooming with an intoxicating scent. Outdoors, Mahonia aquifolium has lovely pinkish buds that are opening to bright yellow blossoms. This is my one-and-only hellebore. I think it doesn't get as much winter sun as it would like, but it's smothered in blossoms anyway. Rhododendron P.J.M. is also covered in gaudy mauve blooms. This shrub was purchased last fall for its unusual reddish bark and the tag must have been faded from the sun: I thought the flowers would be a soft pink! Ribes sanguineum is in full, beautiful flower. Daphne odora is still going strong. One or another rosemary in the MulchMaid's garden has been in bloom since December. Camellias continue blossoming outside the living room window. Carex morrowii 'EverGold' is blooming with cute, hairy little inflorescences. It must be happy there on my front porch. Sarcococca hookeriana var. humilis is finished blooming but has formed a few dark purple berries. A native huckleberry is blooming. Lastly, the kinnick kinnick, another Northwest native, is blooming with tiny urn-shaped flowers typical of the arctostaphylos family. Visit Carol at May Dreams Gardens to see what else is blooming in gardens across the nation and around the world today. My old faithful plastic watering can cracked over winter. I have a metal one, but the rose is rusted on, so it only sprinkles gently. Sometimes you need a good gush of water when you're planting or watering pots, so off I went to Fred Meyer for a new one. But of course I had to look around the garden center while I was there. It was total color overload. These hostas looked good, but unseasonably advanced. Several displays of flaxes shivered outdoors on this 46 degree Friday afternoon. The hellebores were in fine form, though. The cordylines were looking pretty chilly, too. A cautionary sign hadn't been well considered: most of the available plants were perennials, and even they wouldn't want to go in the ground just yet, I think. A sea of euphorbia. I liked this selection a lot. I want some torulosa junipers in my garden, so I went looking for them in the conifer area. They didn't have any ("Hollywood" junipers are a little declasse for PN, I guess) but they did have this beautiful low variety, Juniperus horizontalis "Lime Glow". Its fall/winter foliage is golden-bronze, but in summer it's a bright lime green. I liked the upright "fin" effect of its branches. Here's how Portland Nursery does spring color. It's more restrained and a lot easier on the eyes, wouldn't you say? And my watering can? Got it! Same can for the same price as Fred Meyer, but for me, a lot more fun to shop for at my second stop! We're planning to paint our house this summer. Of course, the burning question is: what color? Three main color considerations are: 1) contrast with our neighbor's houses; 2) sensitivity to our home's age and style (modest 1956 ranch); 3) a color that enhances the brick details and the foliage that we're gradually adding around the house. Our north neighbors have a soft-teal bungalow with cream trim and brick-red details. Our neighbors' big house to the east has a pale-gray body color, white trim and navy details. We have the limitation of existing white vinyl windows, so we know our casing trim will be white. Enter the Sherwin Williams-Visualizer. This clever software lets you upload a photo of your house, then select any number of areas on the picture to "paint" with a selected SW color. It's simplified Photoshop, but the work of figuring out opacity is done for you, and the result is surprisingly realistic. Screen color is the biggest limitation, but it really helped us get the effect of a range of colors on our house. How about a dark sage green? How about a bright aqua blue? Very mid-century modest. This is nice, but is trending too close to our north neighbors' color. This is a greened-up version of the color above, and green foliage looks pretty nice in front of it. It could work. I think this is the perfect mid-century color: Burma Jade. It's got great contrast to the foliage. But that's a pretty saturated color for the amount of siding we have. Could I get used to it? Could my neighbors? 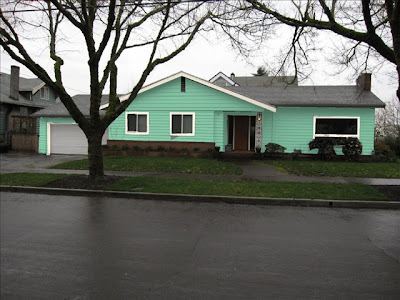 Light green was extremely popular in the fifties and sixties. Why can I not get past thinking of it as "hospital green"? But foliage looks good in front of it, and I like it with our brick trim. This chocolatey gray-brown is easy on the eyes, but may not be lively enough to really enhance the foliage in front of it. There may be too much contrast with the white trim. And it's not very mid-century. But I like it. Here's a color I wouldn't have thought I'd like, but the deep blue-green looks good with the brick. Foliage seems to disappear up next to it, though. Dark brown. Maybe for a bungalow, but I think it has a sort of cabin look I don't love on our ranch. It would make me want to plant all golden-leaved plants in front of it ... hmmm. Harvest gold. This is another of those colors I have a hard time with, but I may be coming around: it looks good with the reddish brick. And look at how nice the foliage looks in contrast. A variation with less saturation could work. And finally, a deep gray-green. I see houses painted like this and I love the effect. But is it mid-century sensitive? And our foliage completely goes away in front of it. The next step will be to narrow our options. Then we'll get quarts of the paint to try them out on parts of the house in addition to the front facade you see here. If this were your house, in which color direction would you be heading to enhance the garden?